The north and East sides of the Island are very sheltered. The South side is exposed to Georgian Bay. The island is just 1 km from the mainland, but almost 50 km around. It would be easy to spend 5 days here. There are also numerous opportunities to venture to nearby islands. East of the largest freshwater island in the world, Philip Edward is the wild cousin of Manitoulin. Make the complete tour for a taste of quiet inlets and wide open Bay. A detour to the Fox or Hawk Islands adds the feel of the Bay's tiny islands. Just be prepared to get stuck out there if the wind comes up. Chikanishing Creek offers a sheltered and picturesque paddle before being spit out into the full expanse of the open Bay. Collins Inlet was a lumber town from 1886 to 1918. The few buildings that are left are now part of Mahzenazing River Lodge and the inlet is a highway for pleasure boats alone. There are many campsites in Collins Inlet along the shore of Mill Lake (the big slice in the eastern half of the island). Good camping is also found around Big Rock Portage (between Silver and Bateman Islands on the south side). If the weather is calm, venture out to the Hawk islands and explore the woods and dramatic landscape. From Green Island you can see nothing but water on the south horizon — a humbling experience. Beware that waves can creep up while you're there and may not be evident until you are off the island again. NOTE: water level forecasts for July for Lake Huron – Georgian Bay are 0.22m (8.6in) above chart datum, which is the marine chart indicated depth. Watch for hawks, heron, and bald eagles. 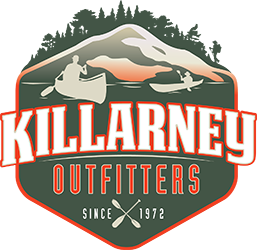 The first 8 km on the north side of Collins inlet is Killarney Provincial Park. At the eastern limit of the island, the east side of Beaverstone Bay is part of the Point Grondine Indian Reserve (private land). There are several privately owned cottages on PEI, but most is crown land. Wind will dictate your direction of travel. Try to plan to be in Collins Inlet during the windiest part of your trip. This can be hard to predict over a week. Get a long-range marine forecast before you leave. Even better, take a radio with you and check the weather channel (88.9 FM). Failing a forecast, or if it is calm-ish at the start of your trip, start on the outside of the island so that you don't have to paddle into the dominant west winds on the exposed side of the island. Collins Inlet is a busy boating channel. Stay close to shore and out of the way. Lynx Images' Ghosts of the Bay tells the colourful story of John Bertram coming to the Collins Inlet in 1886 to take over the mill that prepared lumber from the La Cloche Mountains (Killarney). The town grew to 200 residents until the mill burned in 1918. Read it. It's a great tale.